Ray Pearson was born and raised in Carlsbad and as of 2014 is the President of the Board of Trustees for the Carlsbad Unified School District. Pearson has over 40 years of community impact through his involvement with the Boys and Girls Club, YMCA, Rotary Club, North Coastal Prevention Coalition, Carlsbad Charitable Foundation and many other organizations within our community. 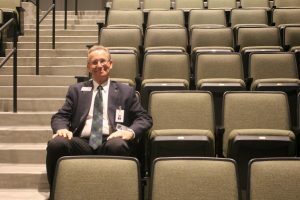 We got a chance to find out what influenced him into running for the President of the Board as well as how the board influenced the decision of building our Performing Arts Center (PAC). Ray Pearson sits comfortably in the new PAC. The school board had a huge part in the building and funding for the PAC. Q: Describe a normal day for you at work? A: [A] typical day is everything from visiting campuses, talking to parents, talking to administrators and students and reading reports. A: Making decisions people don’t like. Q: What made you want to work for the school district? A: I want[ed] to be on the school board because of teachers in my lifetime, inspiring me, and my passions. One of my passions was always to serve in government and for the communities that I lived in. Being on the school board it became very apparent when we moved to Carlsbad and our son was attending Carlsbad that I can make an impact from my business background on my community background and really just my travels domestically and internationally, bringing those experiences and those skill sets to benefit our schools. That was really what motivated me. Q: What are some of the most common things discussed at CUSD board meetings? A: Budgets, curriculum, how our local control accountability plan is working and what needs to be improved. We talk about everything [from] improving student performance, student life and the mental health of students. Q: Recently all of the schools’ websites changed, could you explain how that was decided and why it was decided. A: So one of our major responsibilities is to make sure that all the stakeholders, and let me define stakeholders; students, parents, teachers, community members, and businesses,… know what’s going on. And there are several ways that we communicate, and the website is one particular way. We’re constantly evaluating [if] the website is easy to navigate. So the refresh has to do with the feedback we got from stakeholders. That the navigation [was] difficult, or it [needed]to be improved or information was lacking. done for the school district. Q: What is the difference between your job and other members’ of the boards? A: This year, 18-19, I’ve had the responsibility of the president of the board, my colleagues on the board have to elect me. But it’s really done in a circular way and by how many years you’re on the board, but still, your colleagues have to agree that you’re going to take responsibility for the board, both publicly and so be responsible for conducting the meetings and setting the agenda as well too. So I’m the public face of our school board and there’s a vice president, secretary, as well and we alternate positions, and it’s one based on seniority as well. We all have a singular vote I don’t have a [higher] vote than others, majority rules on anything that we vote on. It’s three votes to be in favor of or against a proposition. Q: How are the big decision[s] of the PAC being built made? A: The PAC for Sage Creek High School came out of Proposition P bond money. And the community voted for that, so they’re paying for Sage Creek High School through property taxes. Because they saw a need for another high school and they saw a need for the high school to have a performing arts center at the time, [they] said that they wanted to have an equitable curriculum for our students at Sage Creek as we do at Carlsbad [and] visual and performing arts was an important element of that. 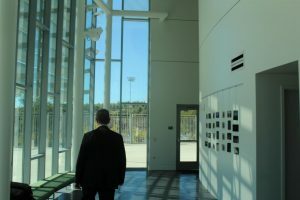 Sage Creek High School’s new visual and performing arts center. Q: What is your final statement that you want to let people know about the board and how it affects our schools? A: Your board has a responsibility to govern how this district is going to achieve goals for their students and set the agenda for those goals. It is always important that all the stakeholders; students, parents, teachers, administrators, community members, businesses— tell the board what they want the schools and students to achieve. 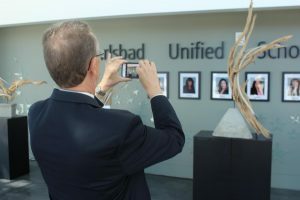 So our board has set an agenda and goals for what students should be able to come out of 12th grade to achieve and say “I’m prepared to go off to college or career or both when I leave Carlsbad Unified School District.” We need to give you the foundation to be successful to do that [and] the other is to be lifelong learners. And that doesn’t mean to always read books all the time. But to enquire, that you’re always thinking about what else can I learn about, and not be satisfied with just the knowledge that you got taught in high school or in college or just in life learning, that you’re a lifelong learner. From that learning, you’re able to contribute not only to yourself or [to] your own family but to whatever community you live and in the country as a whole. The last thing is about citizenship, I know when the voting right was given to eighteen-year-olds I was in high school. And I was so excited because I had a lot of opinions about how our country was being run and I wanted to have a say in it. My vote was what mattered and I wanted to be counted in about how I felt about certain things. So our district does emphasize from kindergarten through twelfth grade the importance of citizenship and knowing not only to vote, [but knowing] your constitution, your bill of rights, how laws are enacted both statewide and federal and how things are done in the city of Carlsbad. [When students] come up and say you know I really want the district to do this. I get so excited because that’s citizenship, they are speaking up for what they believe is right. They are taking advantage of democracy. A lot of people fought really hard to get [this right].